Highly creative, emo hairstyles have their root in the black layered look that made the Emo hairstyles famous. Long emo hairstyles for girls are some of the most attractive, playful, and individualistic hairstyles. They’re easy to customize to reflect your own personality. Apart from that, these haircuts add an extra coolness factor to your look. 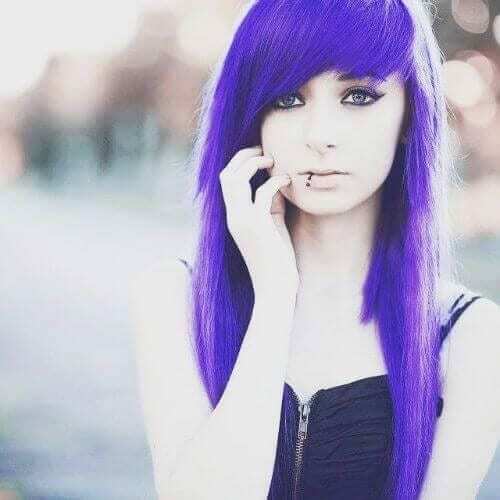 Find your hairstyle inspiration with these 30 impressive long emo hairstyles for girls. 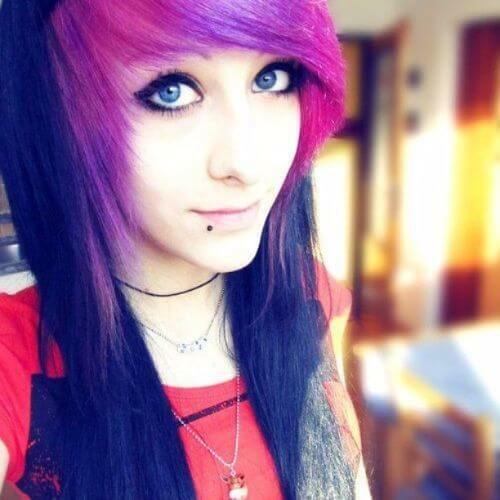 This is one of the best examples of long emo hairstyles for girls that parts with the classic black layered look by adding a splash of bright color. 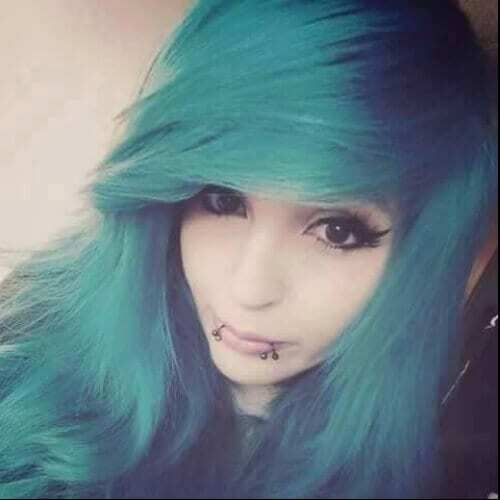 The bangs and front layers, also defining for Emo hairstyles, have been died in a bright blue color that makes the look lightweight, playful, and edgy at the same time. Show the full color by allowing the bangs to weigh heavily on one side. A new take on the scene hairstyles for girls is to replace the fringed, voluminous bangs with blunt bangs covering the entire forehead. It’s no secret that this is one of the vamp style elements that render even a classic black jet emo hairstyle for girls all the more attractive. 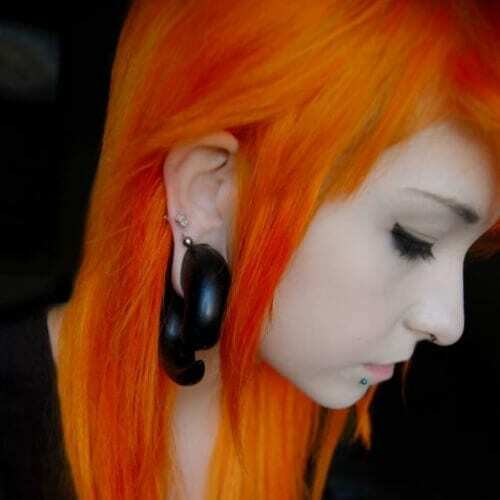 Emo hairstyles for girls with long hair don’t necessarily have to come in one color. Look at this gorgeous example of a mix between blonde and brunette. The blonde bangs and front tresses do a great job with framing the face and enhancing the naturally beautiful traits. This stunningly deep red color is perfect for long emo hairstyles for girls. With a thick set of bangs covering the forehead and a flower headband, this hairstyle couldn’t be any cuter. Notice the messy tone of the look. It adds an extra romantic note. This hair color can make the transition between looks super easy. A vivid blend of green nuances turns this hairstyle into a stunning look. The layered bangs and front tresses have been chopped into a layered finish. 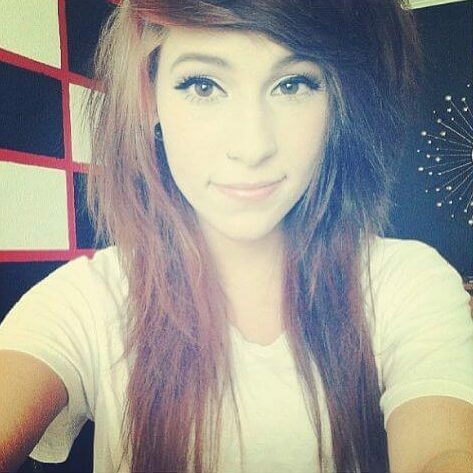 Even natural colors with slight overtones look stunning on long emo hairstyles for girls. Notice the dark chestnut overtone of this classic, perfectly styled hair. If your eyes are blue or green, these types of overtones are ideal for highlighting the color of your eyes and fair skin tones. 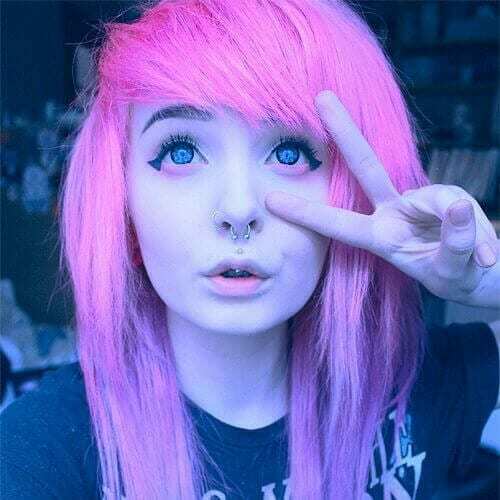 This is one of the most stunning haircuts for Emo girls. The green color block is another refreshing style element for an emo hairstyle. Make a deep side part and let your tresses flow, revealing the green hues. You don’t have to flaunt long Rapunzel tresses to sport your favorite Emo hairstyle for girls. Take a cue from this medium length cut. Add more style and personality by dying your hair in a representative color for you. We love this shade of blue. Green hair and dark eyes work together like a charm. Draw even more attention to your emo hairstyle by tweaking some of the classic style elements. Instead of the layered, fine fringe, ask for blunt cuts on both the bangs and the layered tresses. 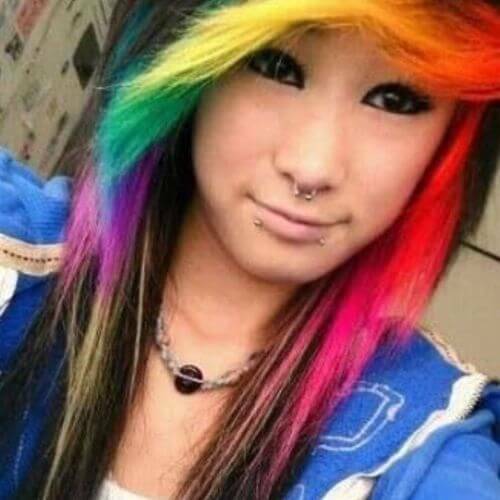 If you thought jet black is the only hair color you can sport with an Emo hairstyle for girls, think again. This is a telling example of how two vivid colors can be blended to create a refreshing Emo look. Blonde and fiery red are just two of the strong colors you can use to achieve a similar look. However, any strongly contrasting colors will do. During a torrid summer day, letting your hair down may not be the best idea. 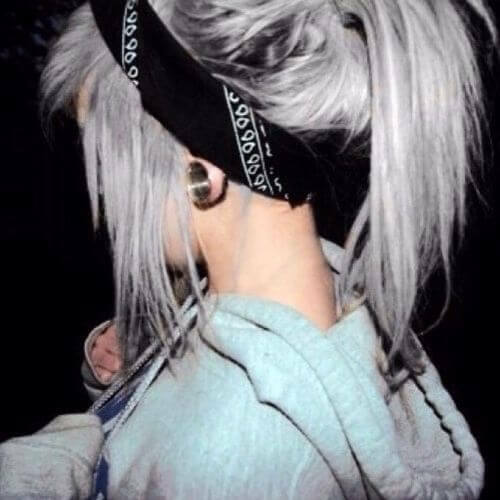 Use a bandanna to gather your hair in a funky updo that’s edgy and cool. Although anything you have at hand will do the job, we recommend the traditional black and white. 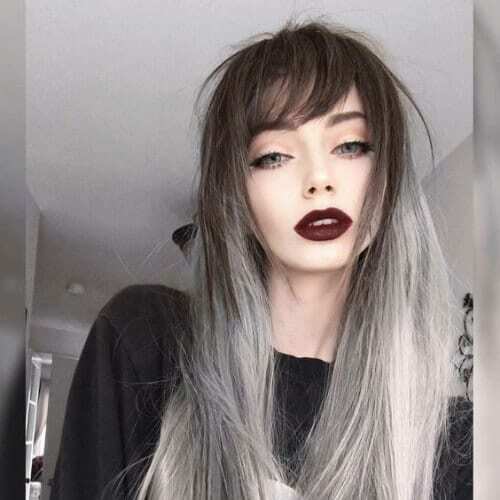 This is one of the most stunning wavy emo hairstyles we have spotted until now. The electric baby blue hair color is cute and soft, yet eye-catching and a whole lot of fun. Applied to long, wavy hair, it becomes even more vibrant. A duo of colors that renders this long emo hairstyle for girls gorgeous. When perfectly straight, your hair will reveal the intensity of each color. Therefore, hurry up and invest in a high-quality hair straightener. While the base color is a natural dark one, the bangs are colored in a contrasting color. In fact, there are several colors which draw attention to the playful yet edgy combination. From the baby blue to the dark blue highlights, we like them all. Sure, Emo fringe styles have been around ever since the beginning of the Emo culture. Nonetheless, the fringed rainbow bangs is a new tweak that spells vivid, refreshed looks. We love this new take! Long Emo hairstyles for girls are ideal for stylish updos that exude individuality. Add a strong, eye-catching hair color like this coral pink overtone and you’ve got the recipe for success. Add a sophisticated note to your look by wearing these cute hair accessories. Long emo hairstyles for girls offer plenty of flexibility in terms of styling. Try on different styles and find your own. While the hair color may be a classic of Emo hairstyles for girls and guys alike, the spiked back and top and the fine fringes give the hairstyle a more personal note. Straighten your hair with a brush to create more volume. Use some hair wax to create the feathered look. Long, fringed bangs are characteristic of Emo hairstyles. Typically side-swept, they highlight facial features by covering the forehead. This hair color duo makes this long emo hairstyle for girls not just cool, but super stylish. Switch the classic jet black for this vibrant fiery red. Straighten your hair perfectly to get this fine polished look that brings out the red hues at their utmost intensity. This hairstyle and hair color are perfectly suited for fair skinned girls. Emulate the colors of a bonfire with these stunning colors blended in this perfect balayage technique. Straight hair following the patterns of long emo hairstyles for girls is the perfect medium to show off your cool hair color. This chic, romantic long emo hairstyle for girls is one of our favorites. We like everything from the pastel hair color to the styling and accessories. We can also give a nod to the makeup which, as always in this subculture, is on fleek. The great thing about long emo hairstyles for girls is that they work well for both girls with thin hair and girls with thick hair. The bangs, fringes, and layers can create a structured, voluminous look and take away the extra volume characteristic to thicker hair. Style up by creating this messy yet chic updo. 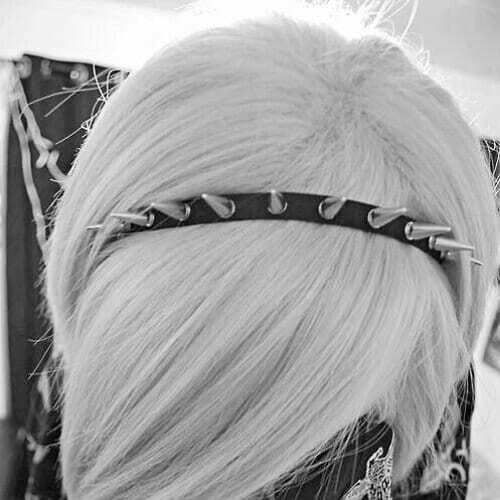 Complement it with a stylish hair accessory such as a black leather headband with silver spikes and your party look is ready. The look is even better if you play it off a complimentary hair color such as gray. If you have naturally thin hair, then layered emo hairstyles are the best option to create a structured, voluminous look. Thanks to the layers, your hair will fall naturally in an effortless voluminous hairdo. Use hair colors wisely. They too can help create the illusion of thicker hair. Even though it started out with the emo swoop which is still the most popular and most well-known of all the emo hairstyles, this subculture has long since evolved when it comes to its esthetics. This is the new look. 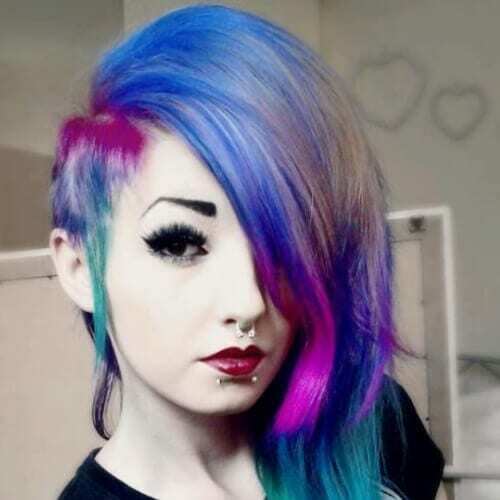 Building on the idea above, the emo trend has also started to adopt more color when it comes to its hairstyles. For example, you can still wear the emo swoop, but in electric and nontraditional shades, such as this indigo blue. You can also wear plaits if you choose. As long as you still have the characteristic emo long bangs and the accessories that traditionally belong to this subculture, it will be considered an emo hairstyle. Here’s another example of how the emo hairstyles are moving into a more contemporary and even post-modern phase. This long emo shag in a pastel purple ombre has been decorated with furry animal ears. Speaking of ombre, this example is a stunner. It starts out with a fantastic mushroom brown that slowly melts into a rainy gray. Needless to say, this color is perfect for the fall, as it will replicate the colors of the environment. 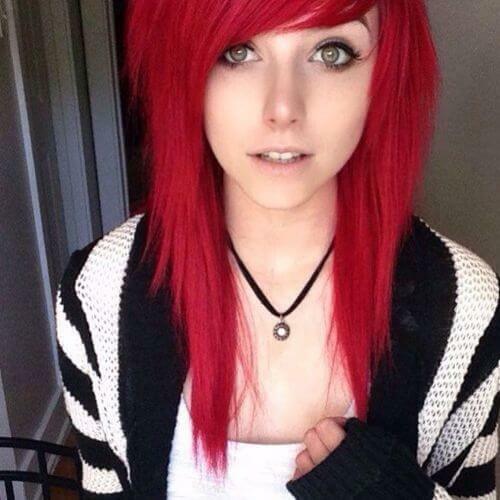 These are the 30 impressive long Emo hairstyles for girls we have in store for you. Find some amazing hairstyle inspiration for your next look change or to refresh your hairstyle. 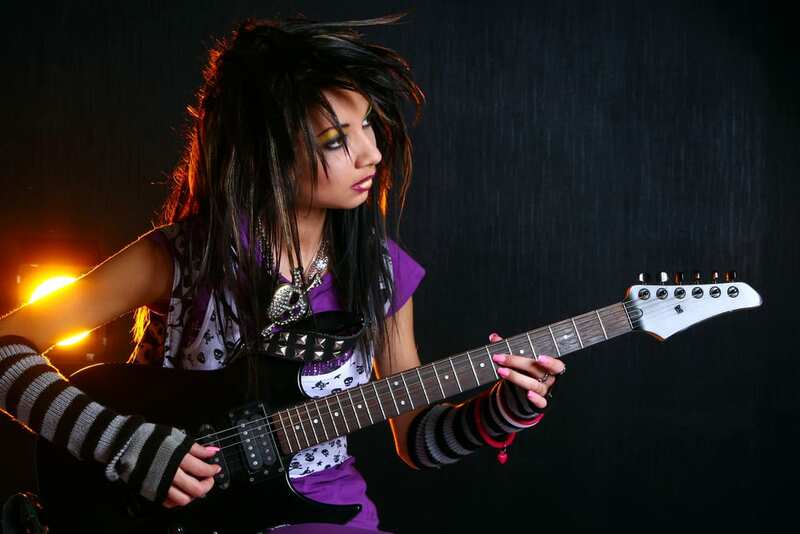 Nowadays, bright colors and other style elements add to the beauty of emo hairstyles. Beyond hairstyles, the Emo wave is a lifestyle. If it defines you, don’t shy away from showing it.